Update (2017-02-03): Most free bid opportunities are going away. One of the simplest ways to get free bids on QuiBids is by subscribing to the Weekly Newsletter. Every week, QuiBids sends out a newsletter that highlights a few great deals that were won in the previous week, in addition to showcasing some upcoming auctions on QuiBids. Not only will you receive information about recently sold and upcoming auctions, but you will also get the latest scoop on new QuiBids site features, contests and promotions, and much more! 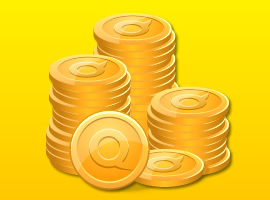 Once you’re subscribed to the QuiBids Weekly Newsletter, you will earn the QuiZette Badge and 3 FREE bids! To subscribe to the QuiBids Weekly Newsletter, simply go to your My QuiBids page, select MY ACCOUNT and scroll down to Email Preferences. QuiBids strongly encourages all bidders to read through QuiBids 101 and the FAQs on the site, especially if you’re a new QuiBidder. After you’ve done your homework, be sure to take the quiz located on the QuiBids 101 page. You must be logged in to take the quiz. Once you pass the test, you will earn 3 FREE bids and The Training Day Badge! Need help studying for the QuiBids 101 Quiz? Check out this nifty primer here. Have you ever referred a friend to QuiBids for Free Bids? QuiBids gives all users a unique referral link, which you can send to your friends via email, social media, or even post on your blog or website to encourage signups through your link. You will receive 25 FREE bids for every person who clicks on your link, creates an account, and purchases a bid pack. Once you refer 3 friends to QuiBids, you will receive the Top Recruiter Badge and 25 additional FREE bids! Having trouble getting your referral bids? This post should help. Every Monday – Friday, we host a sweepstakes on our Facebook Page where four different QuiBidders win 50 FREE bids each day. To enter, go to our Facebook Page and click on the Free Bids app under our cover photo at the top of our page. Fill out the form and click “submit” to be entered in the contest. You can enter once every 24 hours, so be sure to head back to the our page and enter every day for better chances of winning. Have you submitted an entry yet? Click here to enter to win 50 Free bids. *Read more about QuiBids Daily Sweepstakes here. QuiBids also hosts a contest on Twitter for 50 FREE bids. To participate, you must first follow @QuiBids on Twitter. Every weekday, QuiBids will post a Tweet with the hashtag #FREEBIDS asking followers to respond or ReTweet. Each response/ReTweet is your entry into the drawing for 50 FREE bids! Similar to the Facebook Daily Sweepstakes, you can enter the Twitter Sweepstakes every day for better chances of winning. Wanna win 50 #FreeBids? Just RT this tweet by 4p CST to enter. Ready? GO! Every time you purchase a product from the QuiBids Store you’ll get Free Bids. Yes, you heard that right: FREE BIDS. So if you don’t have time to bid in an auction, then the QuiBids Store is for you! Go here to learn more about the QuiBids Store. With QuiBids’ large assortment of products, and the ability to get huge discounts in auctions, why shop anywhere else? If you win an auction with a Gameplay attached, then you’ll have the opportunity to play QuiBids Games for Free Bids. Click here for a detailed explanation of QuiBids Games. What’s your favorite way to get Free Bids? Tell us in the comments below! How to win 50 FREE bids on QuiBids! The Daily Sweepstakes – Your daily chance to win free bids! How to get free bids and gameplays on QuiBids.